My business partner in Arizona bleeds black and orange, he wouldn’t be caught dead on any motorcycle that didn’t come from “The Motor Company”. Well, that’s not entirely true but pretty damn close. In all the years I’ve known Les if he’s not in an Aloha shirt (at his pool party) he’s is wearing a Harley T-Shirt…no kidding. Les now lives and runs the Arizona arm of our company…in a gated community where everybody drives golf carts to get around. Today I found exactly what he needs…a Harley Davidson Golf Cart. I’ve written before about how Harley has done just about everything under the sun in the motorcycle business. From buying up Italian motorcycle companies, to trying Cafe Racers, racing little 100cc two stokes in Baja, getting engines from Porsche, you name it. But Golf Carts? Well, when two wheels aren’t enough for you anymore it’s time for the coolest golf cart you can get. A Harley. There is feeling of irony here. The Golf cart is a single cylinder 245cc gas engine three wheeler. It was designed by ‘Willie G’ when he first joined the family business. 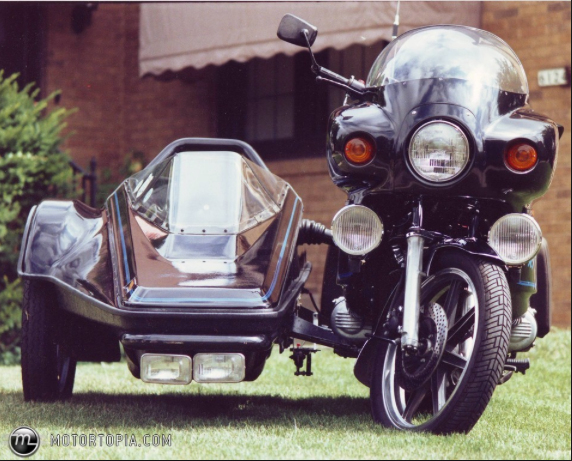 It later became a four wheeler, but the three wheeler has a cool factor that the later version can’t match. Now here is where I get a chuckle, there truly is only one Harley Davidson I would like to own, the XLCR…designed by Willie G. From Golf carts to cafe racers Willie G is probably the most ‘Outlaw’ of Outlaws at Harley. I found a pretty nice 1973 Harley Cart on ebay today, it runs good, looks good and comes with a spare motor, wheels and some extra parts…not bad for a pretty resonable price. Think about it, when you can’t ride your Road King anymore you can still ride a Harley around your Senior Citizen community and be the envy of all your golf buddies. Not to mention the ladies! Click on the link below for more info and pictures. This entry was posted in ebay, rare motorcycles, vintage cafe racers and tagged harley davidson, vintage cafe racers, vintage motorcycles on April 27, 2016 by themotoworld. There are times you remember that are still stuck in your mind decades later. Some are good and some you regret. One that I regret was a first date with a beautiful girl way out of my league. I was a senior in High School when the movie Easy Rider came out. My car was all clean and shiny, the interior was vacuumed, and I was showered and shaved. I was ready! Now here is the ‘DFU’ moment came in, I took her to the Sepulveda Drive-In theatre to see Easy Rider. I don’t know what kind of movie she thought it might be, but it sure wasn’t what she hoped it would be. The thought of any back seat romance went out the window (the one that held the speaker) and I took her home before the movie was over. I found an old school ‘Long Bike’ on ebay today and it is what brought back that memory. If you think Saturday Night Fever was the best movie made and the Bee Gees the best musical group..then this is the bike for you. If you love ‘Tuck and Roll’ interiors and metallic paint jobs on classic cars…this bike is for you. If you want a motorcycle that would be painful to ride but you look cool…this bike is for you. A little history here…you knew that was coming. In 1936 Harley Davidson replaced the ‘Flathead’ motor with the new OHV (overhead valve) motor. An interesting part of this story is that development of the new motor was all done during the “Great Depression”. The Flatheads came in two sizes 74 and 80 cubic inches and produced between 30 and 36 HP. Not bad for the time. When the new OHV motor came out it was only 61 cubes but produced 40HP! Smaller motor but more power, what more could you ask for? Well, riders did ask for more so in 1941 it pumped to 74 Cubic inches and a bit more power. The 1947 Harley Davidson was the last of the “Knuckleheads” It was called the ‘Knucklehead’ because of the way the head was shaped and the valve cover. Later on The Motor Company changed some components and put a different valve cover on and the bike became the ‘Panhead’. The thing is is that the Knuckelhead lasted only 12 years but the same ‘basic’ design is what still powers your new HD Ultra Glide CVO Classic today. Now back to the bike I found on ebay today. You gotta dig metal flake, you gotta think long bikes are way cool, you have to be a massochist and more importantly, you want to look cool!!! This is a bike that will draw attention no matter where you go. Because of it’s size, you will always a parking spot to yourself, you will get more attention than a Sports Illustrated bikini model (well maybe not that one…), and you’ll be seeing your Chiropractor on the Monday after riding on Sunday. But, it will be worth it. This is a very cool bike just because. It’s had a bunch of work done on it and looks great for a period piece. Click on the pics below for more pictures and more info. This entry was posted in antique motorcycles, custom motorcycles, ebay, rare motorcycles, vintage motorcycles and tagged choppers, harley davidson, vintage harley davidson on June 10, 2015 by themotoworld. A while back I applied for a job at a Harley dealer. The general manager, the owners wife and I were having a good interview until I said the only Harley I really wanted to own was an XLCR. If you put your money on me not getting the job, you win. I remember when the XLCR showed up in 1977. It was Wille G Davidson’s first design job and I, being a Brit bike guy, was stoked! We all know that the AMF years were not Harley’s finest (mechanically) but we did get the XLCR and the original ‘Superglide’. Not too bad. But really, the bikes were junk. “Hardley Abelson”, “Hardley Driveable” and other names were applied that I can’t print here, but it was a good design time. The XLCR was a modified Sportster…same lump of a motor, some slight chassis changes and some cool styling. But…according to the purists it wasn’t a Harley. It was the Redheaded stepchild. Thats why it only lasted a couple of years. But, I still want one. I got the next best thing…a Buell. I found a really cool 1979 XLH Sportster on ebay this morning that a guy, who just like me wanted an XLR, built a better one. This is one sweet Harley Davidson. Good upgrades, a beautiful tank and tail section…all of it. Yeah, you’re going to have pay attention to it…there is an old adage about vintage British bike, “Ride it for one hour…Work on it for two”, well this bike is probably right in there as well. But I think it will be worth it. This entry was posted in custom motorcycles, ebay, rare motorcycles, vintage cafe racers and tagged harley davidson, harley davidson sportster, harley davidson XLCR, vintage cafe racers, vintage harley davidson, vintage motorcycles on May 17, 2015 by themotoworld.